Narrative of David runs from 1 Samuel 16-1 Kings 1 in the 1 &2 Samuel, 1 & 2 Kings telling of Israel’s story. It runs from 1 Chronicles 11-22 in Chronicles telling of Israel’s story. David is attributed as the author of much of the book of Psalms and is mentioned frequently throughout the scriptures as a model of what a king should be and as a figure from which the hope for the people will come. Narrative of Solomon is told in 1 Kings 3-11 in the 1 & 2 Kings telling of Israel’s story. It runs from 1 Chronicles 11-22 in Chronicles telling of Israel’s story. Solomon is the attributed author of some of the Psalms, the book of Proverbs, Ecclesiastes and the Song of Songs (although he is probably not the author of these varied works as judged by the language). 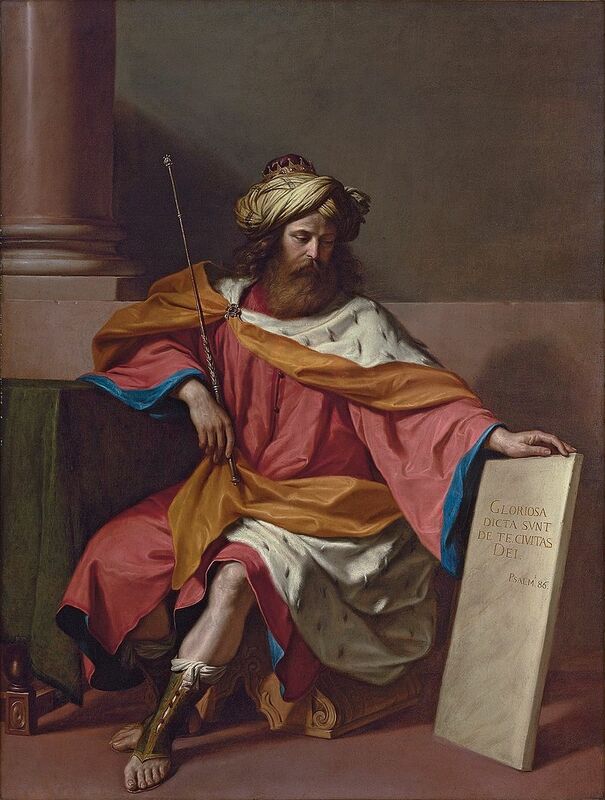 Builds the first temple, initially favored by God but there is an underlying critique of Solomon’s reign in the scriptures and he eventually turns away from the way of the Lord. Narrative of Rehoboam is told in 1 Kings 12, 14:21-31 in the 1 & 2 Kings telling of Israel’s story. It runs from 2 Chronicles 9-12 in Chronicles telling of Israel’s story. He is viewed as an unwise and unfaithful king whose arrogance causes a split in the nation of Israel. Narrative of Abijah (Abijam)is told in 1 Kings 15: 1-8 in the 1 & 2 Kings telling of Israel’s story. It occurs in 2 Chronicles 13 in Chronicles telling of Israel’s story. Kings and Chronicles have a very different view of Abijah, Kings narrates that he continued in the sins of his father (Rehoboam) while Chronicles narrates him as a heroic figure that defies the king of Israel. Narrative of Jehoshapat is told in 1 Kings 22: 41-50 in the 1 & 2 Kings telling of Israel’s story. It runs from 2 Chronicles 17-20 in Chronicles telling of Israel’s story. His 25 years reign is also viewed positively in both narratives. Narrative of Jehoram is told in 2 Kings 8: 16-24 the 1 & 2 Kings telling of Israel’s story. It occurs in 2 Chronicles 21 in Chronicles telling of Israel’s story. Viewed as a king who betrayed the reforms of his father and grandfather and returned the people to worshipping other gods. Elijah the prophet enters the narrative during the reign of Jehoram. Narrative of Ahaziah is told in 2 Kings 8: 23-29, 9:27 in the 1 & 2 Kings telling of Israel’s story. It occurs in 2 Chronicles 22 in Chronicles telling of Israel’s story. His one-year reign is viewed negatively in both narratives and he is killed by Jehu son of Nimshi. With only reigning one year it is perhaps an understandable negation from Matthew’s line, but the genealogy would go through Ahaziah. Mother of Ahaziah, seizes the throne after her son’s murder. Narrative of Athaliah is told in 2 Kings 11 in the 1 & 2 Kings telling of Israel’s story. It runs from 2 Chronicles 22:10-23:21 in Chronicles telling of Israel’s story. Joash is preserved in the line of kings after she orders the death of royal family of Judah. Since Athaliah was a queen rather than a king this wouldn’t normally appear in a genealogy. However, Matthew did include several women previously who would normally be overlooked. Narrative of Joash is told in 2 Kings 11:4-12, 17-21 and 12: 1-21 in the 1 & 2 Kings telling of Israel’s story. It occurs in 2 Chronicles 24 in Chronicles telling of Israel’s story. Joash is kept alive and mentored by the priest Jehoiada and for most of his life did what was right in God’s sight. He is famous for repairing the temple but Chronicles states that late in his life, after Jehoiada dies and under the influence of the nobles of Judah, he returns to the ways of the unrighteous kings. This is perhaps the most unusual negation. Narrative of Amaziah is told in 2 Kings 14: 1-22 in the 1 & 2 Kings telling of Israel’s story. It occurs in 2 Chronicles 25 in Chronicles telling of Israel’s story. Amaziah is listed in 2 Kings as one who did what was right in the site of the LORD but the major event in both narratives is his failed battle with Israel where the wall of Jerusalem is breached and the gold and silver from the temple and the king’s house are stolen. Another unusual negation. Narrative of Jothan is told in 2 Kings 15: 32-38 in the 1 & 2 Kings telling of Israel’s story. It occurs in 2 Chronicles 27 in Chronicles telling of Israel’s story. Jothan is listed as a king who did right in the eyes of the LORD but who did not eliminate the practices of the people that were displeasing to God in the view of 2 Kings and 2 Chronicles. His reign is described as prosperous and peaceful. The ministries of Micah and Hosea occur in part during the reign of Jothan. Narrative of Ahaz is told in 2 Kings 16 in the 1 & 2 Kings telling of Israel’s story. It occurs in 2 Chronicles 28 in Chronicles telling of Israel’s story. Ahaz is a king who did not do what was right in the site of the lord in the narratives and is oppressed by Israel, the Edomites and the Philistines. Ahaz appeals to Assyria for help and attempts to bribe Assyria with items from his house and the officials in tribute, but Assyria rebuffs their call for aid. Isaiah 7 is during the reign of King Ahaz and Isaiah 14:28 begins an oracle in the year of Ahaz’ death. Narrative of Hezekiah is told in 2 Kings 18-20 in the 1 & 2 Kings telling of Israel’s story. It occurs in 2 Chronicles 29-32 in Chronicles telling of Israel’s story. Hezekiah is a righteous king and reigns during an important transition in the region. The Assyrian empire conquers Israel and marches on Judah, but their conquest is stopped, and Judah survives. King Hezekiah is attributed with ensuring that Proverbs 25-29 are preserved. Isaiah records the Assyrian invasion by King Sennacherib of Assyria and the dialogue between God, Isaiah, and Hezekiah as well as a later illness of Hezekiah and Hezekiah’s interaction with envoys from Babylon in Isaiah 36-39. The prophets Hosea and Micah also conclude their ministries during Hezekiah’s reign. Narrative of Manasseh is told in 2 Kings 21: 1-18 in the 1 & 2 Kings telling of Israel’s story. It runs from 2 Chronicles 33: 1-20 in Chronicles telling of Israel’s story. Manasseh is listed as one of the kings who did evil by adopting the practices of the surrounding nations and worshipping other gods. Jeremiah 15:4 lists the evils of Manasseh as the reason for the judgment against Judah. Narrative of Manasseh is told in 2 Kings 21: 19-26 in the 1 &2 Samuel, 1 & 2 Kings telling of Israel’s story. It runs from 2 Chronicles 33: 21-25 in Chronicles telling of Israel’s story. He also did what was evil in God’s sight and was killed by the servants in his house or the people of the land depending on whether you read Chronicles or Kings. Narrative of Josiah is told in 2 Kings 22:1-23:30 in the 1 & 2 Kings telling of Israel’s story. It runs from 2 Chronicles 34-35 in Chronicles telling of Israel’s story. Josiah is remembered as the great reformer king who reintroduced the law to Judah. He dies in a battle against Pharaoh Neco, which seems to have been an unnecessary battle. Josiah’s reign is a time of great hope in Judah and there are even hopes of a new Israel, this is after the northern kingdom is conquered by Assyria, which practices the law and worships at the temple in Jerusalem. The optimism of the reforms of King Josiah are the context for the beginning of Jeremiah’s long ministry. Jeremiah soon sees the reforms are not changing the people and begins to warn that judgment is coming. Jehoahaz’ three-month reign is told in 2 Kings 23: 31-35 and 2 Chronicles 36: 1-4. He is enthroned by the people but deposed by Egypt and Egypt replaces him with his brother Eliakim who changes his name to Jehoiachim. Judah is now caught between the rising empire of Babylon in the north and Egypt in the south. Jehoahaz would not be in the genealogy of Jesus as Matthew traces it. Jehoiachim’s reign is told briefly in 2 Kings 23: 36-24:7 and 2 Chronicles 36: 5-8. In the eleven years he reigned Judah is caught between Babylon and Egypt. Jehoiachim serves Babylon for a time but then rebelled and was taken in chains to Babylon. Many of the proclamations of the prophet Jeremiah occur during the reign of Jehoiachim. The removal of Jehoiachim also sets the context for the beginning of the book of Daniel, where Daniel is among the young nobles brought to Babylon. The son of Jehoiachim who is only eight or eighteen during his brief reign. His reign is told in 2 Kings 24: 8-18 and 2 Chronicles 36: 9-10. At the end of the reign is the deportation to Babylon of the officials, warriors, artisans, smiths and anyone who might exercise leadership among the people and a weak administration under his uncle Mattaniah, renamed Zedekiah. Jeremiah refers to Jehoiachin as Coniah. Zedekiah is placed in his position by Babylon to attempt to retain peace among the remnant of Judah. His reign and the fall of Judah is told in 2 Kings 24: 18-30 (includes the governorship of Gedaliah) and 2 Chronicles 36: 11-21. More of Jeremiah’s proclamations come during the time of Zedekiah, in the final gasps of Judah and Jerusalem before Babylon’s final invasion and exile, than at any other time. Jerusalem is destroyed in 586 and more of the population is brought into exile in Babylon. There is a final rebellion during the governorship of Gedaliah) but the remnant of Judah that survives goes into exile in Babylon. The book of Jeremiah narrates the collapse of Judah in Jeremiah 34-44 and 52. This entry was posted in Biblical Reflections, Gospel of Matthew and tagged 1 Chronicles, 1 Kings, 2 Chronicles, 2 Kings, Gospel of Matthew, Isaiah, Jeremiah, Kings of Israel, Kings of Judah, Matthew 1. Bookmark the permalink.